Karen and I had a great time at the festival. The night before, I ran into the Foothills Brewing guys as they arrived at the Marriott. They were surprised to see me in Knoxville. They are great guys and they have a great set of beers. We headed out for lunch and we settled at the Downtown Grill & Brewery. Karen had the pecan crusted trout and I had the Quesadilla. The food was great and we had a long talk the general manager about the brewery, the beer festival, and where to get good beer in Knoxville. I wish I could remember his name, but thanks for good advice on the where to get good beer. Karen and I headed off to the Leaf & Ale to pick some beer for trip back to Huntsville. 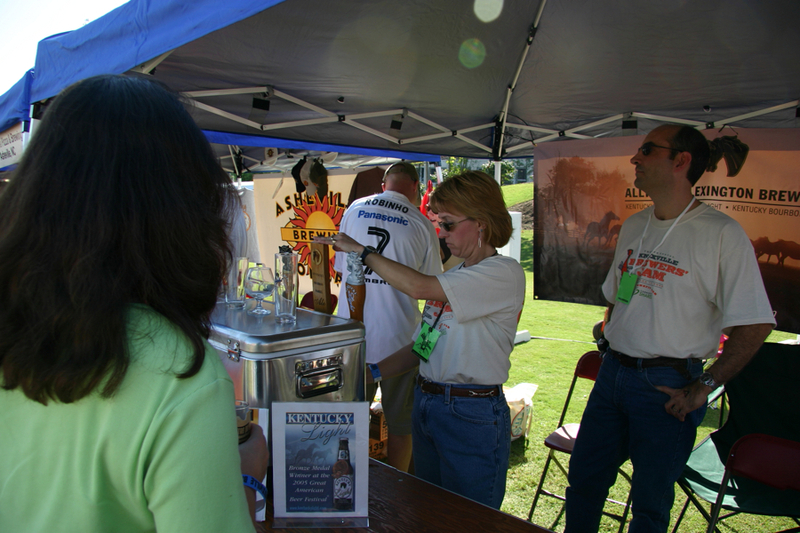 We found a great selection including many beers that would be available at the festival. We arrived back the Marriot and waited for the transportation to the festival. Our driver, KA, was late, but we all did arrive at the festival in due time. We learned that everyone had ‘Will-Call” tickets which meant we had a line, but there was no line for purchasing tickets at the gate. Maybe next year, we can arrange for the tickets to be at the hotel. Alltech’s Lexington Brewing Company had great beer called Kentucky Bourbon Barrel Ale which is aged in spent bourbon casks. Here you can see Karen waiting as it is being poured. It gave the ale a mellow bourbon’s oaky over tone. We enjoyed Rogue Ales‘ Hazelnut Brown Nectar way too much. Foothills Brewery‘s Oktoberfest was super. It is one of the best Oktoberfest that I have had this season. 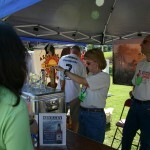 The Tennessee Valley Homebrewer’s Association had a great selection of well made brews. We had a stout and kolsch which were both very good. The first two musical acts were okay, but they were a little too garage band or college fraternity party for me. The next two acts, Scott Miller & The Commonwealth preceded by Mic Harrison and The High Score, were good. I enjoyed Scott Miller’s clean vocal stylings. You can checkout Scott Miller & The Commonwealth on iTunes. This entry was posted in Festivals by Brian Allen. Bookmark the permalink.